Before I started into the text of The Truth of the Cross I read the three endorsements that came with it, one by Thomas Schreiner, one by Scott Clark and one by Bruce Waltke. It was Waltke’s that caught my eye when he said, “The Truth of the Cross is the best book on the cross I have read.” A man of Waltke’s age, Christian maturity and status must have read more than a few books on the cross, making this no little statement. Having read the book, I know it was no exaggeration. The best book on the cross I’ve ever read is Frederick Leahy’s The Cross He Bore, a book I’d consider a must-read for any Christian. Could this one be as good, as beautiful as that? There are few people I’d rather read on this topic than R.C. Sproul. He has an unparalleled gift for explaining difficult theological concepts in a way that makes them accessible and easy to understand. I don’t know of anyone else who does a better job of explaining Reformed theology and the theology of God’s sovereign grace in the contexts of biblical theology and the history of the church. This book does just that. It convincingly unfolds the meaning, significance and power of the cross, showing the necessity of an atonement and providing a biblical defense for substitutionary atonement as understood by the historic stream of Protestant theology. This message is timely. As Sproul says in the first chapter, “I doubt there has been a period in the two thousand years of Christian history when the significance, the centrality, and even the necessity of the cross have been more controversial than now. … Never before in Christian history has the need for an atonement been as widely challenged as it is today.” Yet it is clear from the Bible that if “you take away the cross as an atoning act, you take away Christianity.” We can only understand the atonement if we know about the character of God. “If we are defective in understanding the character of God or understanding the nature of sin, it is inevitable that we will come to the conclusion that the atonement was not necessary.” And so this book examines the character of God, the state of humanity, and the work that must be done to reconcile sinful men to a holy God. Though the book is short, it is dense. 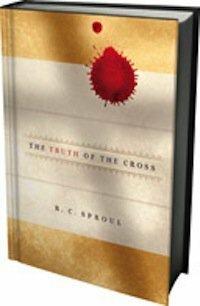 And yet, because of Sproul’s gift in teaching, it is easy to read and easy to digest. It shares the glorious doctrines that stand at the very heart of the Christian faith. It shares the great and glorious news of the gospel. Is this the best book on the cross I’ve ever read? Perhaps. I don’t know that I would recommend this in place of The Cross He Bore but it certainly would make a wonderful complement to Leahy’s title. Less reflective and meditative, but with a greater emphasis on teaching theology, The Truth of the Cross will be a great addition to any library. This and The Cross He Bore could be read together every year and would undoubtedly bring great blessing with each reading. It is good to remember the cross and to come to a greater understanding of what it means and why it matters. The Truth of the Cross will center your thoughts upon the cross and upon the One Who went there willingly so that we could have life. The Truth of the Cross is not sold through Amazon but is (or will soon) be available at Westminster Books. While you’re there, why not also buy The Cross He Bore, currently listed at only $4.03.